The amazing Pandora continues to refine and improve its UI. One of the interesting things about web applications is that they can change from one visit to the next. Depending on your point of view, this can be either incredibly frustrating or delightfully surprising. If you need to rely on effective execution of an application for critical business reasons, then changing the application willy-nilly is not a good idea. What’s key for RIAs is that changes to the UI should seem intuitive and not too jarring. When I first started using Pandora, I made a couple suggestions for improvements on the Pandora Blog. I’m happy to see that the album title is visible and that there is now a “progress bar” indicating how much of the song has been played. Both changes were done in a way that do not change the way you interact with the main UI. They’ve also added a new popup menu that slides up when you mouse over the song. This allows you to rate the song with one-click (before this involved two clicks). This is great, because I actually use this feature occasionally. My only complaint is that I would have switched the order of Thumbs Down/Up (I accidentally gave a thumbs down to a song I liked). I’m sure I’ll get used to it. The application uses OpenLaszlo, which “compiles” to Adobe Flash at the moment. I notice that when I right-click, it states that it uses Flash 8. Does that mean that Linux users are not able to use Pandora? Here’s hoping that OpenLaszlo hurries up and implements its DHTML support. As for Pandora’s advertising model, displaying an ad off to the side is very considerate to its users, but it might not be very effective. 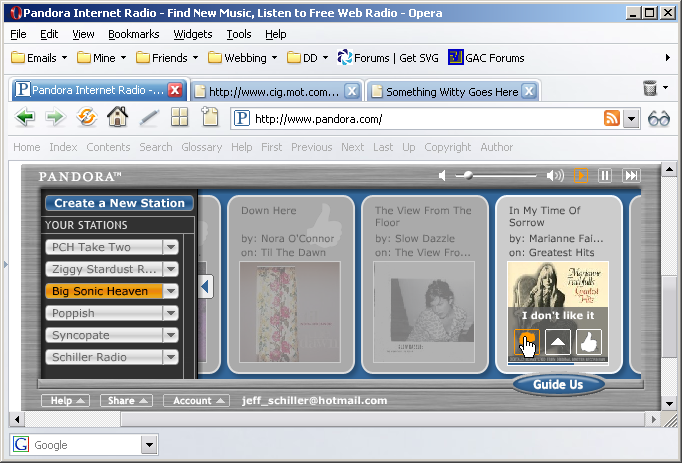 Often, I’ll just let Pandora run in a browser tab and never visit it. However, if I’m thinking about it, I’ll occasionally go back to the tab to rate a song I like or dislike. Even when I do this, if I’m using Opera, I can tear off the Pandora tab and size it to just the size of the main Pandora UI (meaning the ad is not even visible). I wonder how effective Pandora is at selling music… Anyway, I predict within a year that we’ll have audio ads in Pandora as it rides the Crap Wave. I’ll still probably visit though. I started using Pandora this week but I don’t see a progress bar anywhere. And you’re right – the UI is very intuitive. My first visit was absolutely painless. My second visit was exciting and it just keeps getting better. I do like the mouseover menu and the bookmark option. I wrote some more about my finds over on here. re: ads – Art + money has been fraught with complexity for a long time. Maybe this time everyone will come out satisfied, fulfilled and happy. oh – and the screenshot Ryan has on his blog is different from what I see in Fx or IE – think there have been more changes already? Actually Ryan’s screenshot is the UI before the changes that I mention in this blog entry. Oh yeah – there it is. Thanks. It’s not that it uses Flash 8, it’s that YOU use Flash 8. The “about Flash” blah blah blah is local. Dinnae worry, we Linux users can use it just fine.